We are a family that strives to breed Springer's that are sound in temperament, structure, athleticism, and beauty. These attributes prepare them to become cherished companions, and strong competitors. We have owned Springer's for over 20 years. 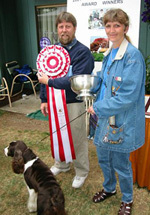 In 1998 we began competing in the Show Ring, and had our first litter in 2002. Since that time, 17 of our Springer's have achieved their Championships, with more soon to follow. We have placed many beautiful companions in homes around the country. 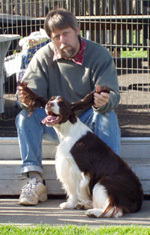 We are members of the local Puget Sound English Springer Spaniel Club, along with the parent club, English Springer Spaniel Field Trail Association. We participate in activities to further the awareness of this wonderful Sporting Breed. We are located in the Pacific Northwest in Washington State near Seattle. We welcome and encourage visitors to meet us and our dogs.